On October 9, 2015, the High Court of Ireland issued a decision—discussed below the jump—very much in line with decisions recently issued by U.S. federal district courts about how feedstocks and power plants relate for the purpose of environmental review. 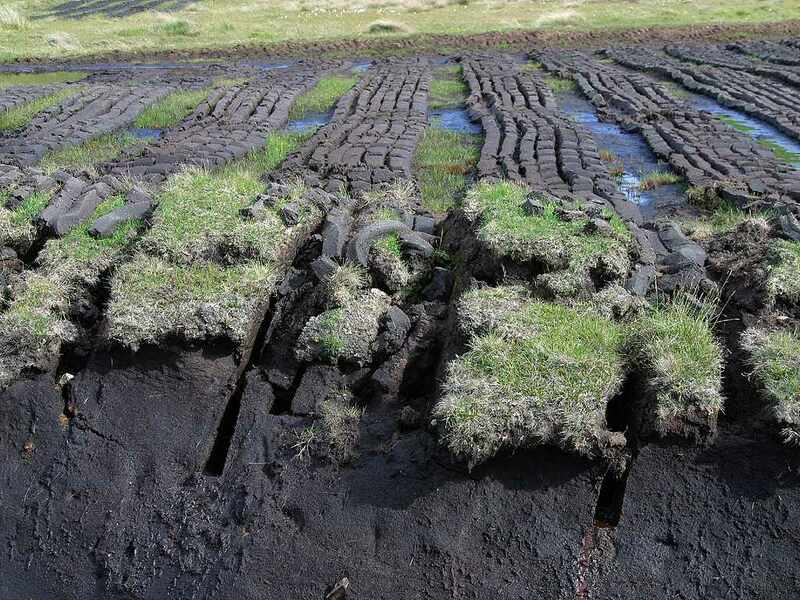 In the U.S., the feedstock has been mined coal; in Ireland, it was peat (pictured at right). In all cases, the basic issue has been whether the environmental impacts of both digging up and burning a feedstock must be considered before permitting the continued or expanded extraction of the fuel or operation of the plant that burns it. These decisions seem to mark a departure from the generally separate treatment of such facilities under both the U.S.’s National Environmental Policy Act and Ireland’s interpretation of the European Union’s Environmental Impact Assessment Directive. In U.S. courts, this has amounted to a new application of the term “reasonably foreseeable indirect impacts” in the context of coal mining and electricity generation; in Ireland, the same can be said for “functional interdependence” as that term applies to feedstocks and power plants. The U.S. cases noted above include WildEarth Guradians v. United States Office of Surface Mining, Reclamation & Enforcement, No. 13-CV-00518-RBJ, 2015 WL 2207834, at *15 (D. Colo. May 8, 2015) (“If OSM can predict how much coal will be produced, it can likewise attempt to predict the environmental effects of its combustion.”), Diné Citizens Against Ruining Our Env’t v. United States Office of Surface Mining Reclamation & Enforcement, 82 F. Supp. 3d 1201 (D. Colo. 2015), appeal dismissed (10th Cir. Aug. 18, 2015) (coal combustion-related impacts of proposed expansion of coal mining activities constituted indirect effect requiring NEPA analysis), and High Country Conservation Advocates v. United States Forest Serv., 52 F. Supp. 3d 1174 (D. Colo. 2014) (EIS failed to disclose GHG emissions from combustion of coal projected to be mined). Taken together, they stand for the proposition that NEPA can require the environmental impacts of coal mining, and of the power plants that burn the coal, to be considered together if they are linked closely enough.. It is important to note that these cases do not stand for the proposition that all mining and power plant operations must be assessed jointly for the purposes of environmental review. Only that encompassing review is required where operations are sufficiently closely related. The Irish case, An Taisce v. An Bord Pleanála  IEHC 633, arose when environmental NGOs, An Taisce and Friends of the Irish Environment, Ltd., challenged the approval granted by An Bord Pleanála, Ireland’s planning board, of Edenderry Power Ltd.’s application to extend operation of its peat- and biomass-burning power plant from 2015 to 2023. Bord Na Móna Allen Peat Limited and others engaged in peat extraction and transport were also parties to the case. The plant had been granted permission to operate in 1998, its permit amended in 2005 to allow for the burning of biomass, and amended again in 2011 to allow burning of still more biomass as well as on-site biomass storage. In 2013, well in advance of the permit’s 2015 sunset, Edenderry applied for a permit extension—one that anticipated continuing to source peat from two nearby bogs. At issue in the case was whether the approval granted to Edenderry had complied with the EIA Directive. An Taisce argued that it had not because it had considered only the impacts of the plant’s operations but not those resulting from peat extraction and transport. Edenderry and the other respondents countered that peat-related operations were unrelated to the plant’s operation for the purposes of environmental review. Specifically, they argued that there was no evidence in the record to “suggest that the extraction of peat from any particular source is wholly contingent upon operation of the power plant,” that the plant could procure peat from other bogs, and that a refusal to extend the plant’s permit would not cause extraction from the bogs at issue to cease. In sum, they argued that the EIA Directive did not require bog- and plant-related impacts to be considered together because there was no “functional interdependence” between the two operations. The High Court, noting that it was required to base its decision on the “actual reality of the project” at issue, rejected these arguments as theoretical—the permit application, after all, contemplated sourcing from these particular bogs, such that any other approach would constitute a material change to the application. Thus, “[t]here is functional interdependence as the power plant relies for the vast majority of its raw material on the designated bogs.” The court also noted that it made no difference that the bogs were independently subject to an air pollution licensing regime. The planning authority, it explained, “is entitled to take the licenses into account” when assessing the impacts of the peat extraction operations. “Any plan or project not directly connected with or necessary to the management of the site but likely to have a significant effect thereon, either individually or in combination with other projects, shall be subject to appropriate assessment of its implications for the site in view of the site’s conversation objectives.” S.I. 94/97 § 32 art. 6.3.